Weight gain is a universal problem faced by millions worldwide. The best way to ensure weight loss is to understand your body’s needs and your current lifestyle. The metabolic rate is the one that helps your body burn calories. Very few people have a fast metabolism and overweight individuals generally have slow metabolism. 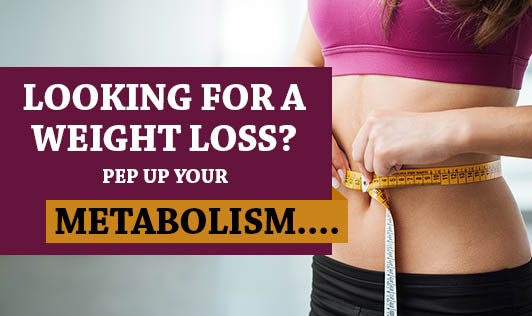 However a faster metabolism will enable you to level your diet and weight. The intensity, frequency and duration of any activity will also have an effect on your metabolism. Eat small frequent meals - A healthy balanced diet will help to speed up your metabolism. It is important to never skip a meal or go on any type of starvation diet. You should always opt for healthy snacks in between meals. The idea to eat frequently is to reduce the hunger pangs and to keep your energy levels consistent which in turn will increase and speed up your metabolism for weight loss. Drink sufficient quantity of water - Drinking 8-10 glasses of water daily helps to increase the metabolic rate. Water cannot replace any kind of juices or supplements for a prolonged time. A dehydrated body causes the metabolic rate to slow down. Intensify your workout - Different activities burn different amount of calories, but the important thing is to raise your heart rate and sustain the activity for at least 30 minutes. Gymming, weight training and physical activities like brisk walk, long run and aerobic exercise increase the heart rate that in turn raise metabolism while you are exercising. Get a good night's sleep - Many researchers have established the point that if you are in the process of losing weight, do not forget to get enough sleep. If you make enough time for a sound sleep, it will benefit by increasing your resting metabolic rate, thereby helping you achieve an effective weight loss. It is ideal if you stick to a fixed sleeping schedule. If you still find it difficult to lose weight, consult a physician for to rule out medical problems like hypothyroid, PCOD, stress, depression etc. which can be barriers for your weight loss pattern!